In three data visualizations, we dive into what you would see looking west or east across the ocean; the contours and makeup of the seabed; and the width of rivers throughout North America. By Fred Sandsmark, (OpenText Analytics). Forgive us in California for being obsessed with water. Our unprecedented drought has caused our brains to focus on the wet stuff, so that’s the theme of this week’s Data Driven Digest. In three data visualizations, we dive into what you would see looking west or east across the ocean; the contours and makeup of the seabed; and the width of rivers throughout North America. Grab a cool glass of water and take a look. Look out: Next time you visit an ocean beach, take a few moments to ponder what’s due east or west from you. Then check out What’s across the ocean from you when you’re at the beach, in 7 fascinating maps, created by Weiyi (Dawn) Cai and Ana Swanson of the Washington Post. The beautiful maps are full of surprises; for example, I was startled to see that Japan is as long (from north to south), as the entire United States, and that Boston and Spain share the same latitude. Thanks to my colleague Michael Singer (@MichaelSinger) for suggesting this item. Under the Sea: Want a glimpse at what lies beneath the ocean’s surface? Check out the first digital map of the earth’s seafloor, created by scientists in Australia. The map, which available in an engrossing interactive version, shows the contours of the seafloor and the sediments that cover it – ranging from calcareous ooze (light blue in the screenshot above) to sand (bright yellow). Some 14,500 data points, collected over 50 years, were compiled by researchers at University of Sydney in Australia; big data experts at National ICT Australia (NICTA) used the support vector machine model for digitization and mapping. H/T: I learned of this map via Mia De Graff of the Daily Mail. 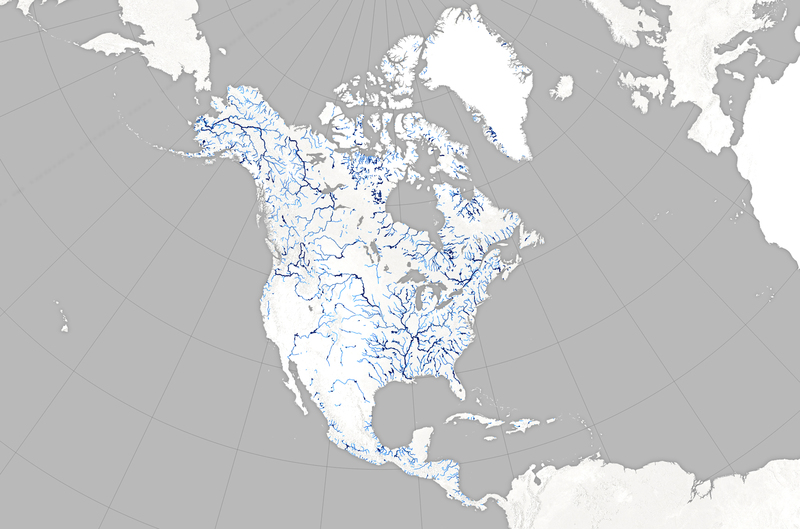 Moving upstream: If your travels take you to rivers rather than the ocean, we have a data visualization for you, too: Hydrologists George Allen and Tamlin Pavelsky of the University of North Carolina have spent years compiling a database of North American river widths. Their painstaking task started with countless images from Landsat satellites; they combed through them to find more than 1,750 without ice or cloud cover; then, controlling for seasonal changes, they used Rivwidth, a software program created by Pavelsky and Laurence Smith of UCLA, to calculate the width of every river. Joshua Stevens (@jscarto) of the NASA Earth Observatory then turned their data into a 2050 x 1355-pixel map; click the cropped version above to see it, and read more (including why they did it) at NASA’s Earth Observatory blog.